Better Looking Records never fails to amaze me. With their latest release by Oxford, England's Goldrush, Ozona, they serve up a band that knows how to write guitar-drenched, Brit-pop-meets-shoegazer tunes with some of the most memorable melodies as-of-late in indie-rock. Album opener "Wait for the Wheels" is a jangle-y, yet powerful rocker, while "Feel" is a simple, bouncy pop ditty. "Let You Down" is an introspective Brit-pop song that is equally tender and rocking, as is the piano-laden, space-pop of "Each Moment In Time". 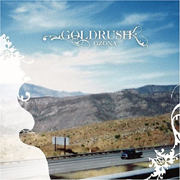 Whether they're writing outright rockers, tender pop numbers, or blending the two, Goldrush delivers pop goodness in a rock shell, always putting the melody and hook first, but meanwhile not afraid to rock out or experiment with textures, tones, and layers. This is a rock band that pushes their own envelope, all while knowing their limitations. I'll give it an A.